Dr. Steven Yarinsky is recognized for the fifth consecutive year as a “Top Doctor” by Castle Connolly Medical Ltd. in the Albany, Capital District and New York metropolitan areas. 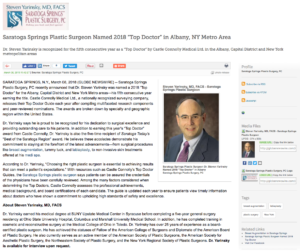 Saratoga Springs, NY – Saratoga Springs Plastic Surgery, PC recently announced that Dr. Steven Yarinsky was named a 2018 “Top Doctor” for the Albany, Capital District and New York Metro areas—his fifth consecutive year earning the title. Castle Connolly Medical Ltd., a nationally recognized surveying company, releases their Top Doctor Guide each year after compiling multifaceted research components and peer-reviewed nominations. The awards are broken down by specialty and geographic region within the United States. Dr. Yarinsky says he is proud to be recognized for his dedication to surgical excellence and providing outstanding care to his patients. In addition to earning this year’s “Top Doctor” award from Castle Connolly, Dr. Yarinsky is also the five-time recipient of Saratoga Today’s “Best of the Saratoga Region” award. He believes these accolades demonstrate his commitment to staying at the forefront of the latest advancements—from surgical procedures like breast augmentation, tummy tuck, and labiaplasty, to non-invasive skin treatments offered at his medi spa. According to Dr. Yarinsky, “choosing the right plastic surgeon is essential to achieving results that can meet a patient’s expectations.” With resources such as Castle Connolly’s Top Doctor Guides, the Saratoga Springs plastic surgeon says patients can be assured the credentials of the physicians have been carefully reviewed. Among the many factors considered when determining the Top Doctors, Castle Connolly assesses the professional achievements, medical background, and board certifications of each candidate. The guide is updated each year to ensure patients view timely information about doctors who have shown a commitment to upholding high standards of safety and excellence. Dr. Yarinsky earned his medical degree at SUNY Upstate Medical Center in Syracuse before completing a five-year general surgery residency at Ohio State University Hospital, Columbus and Marshall University Medical School. In addition, he has completed training in cosmetic and reconstructive surgery at the Medical College of Ohio in Toledo. Dr. Yarinsky has over 25 years of experience as a board-certified plastic surgeon. He has achieved the statuses of Fellow of the American College of Surgeons and Diplomate of the American Board of Plastic Surgery. He also currently serves as an active member of the American Society of Plastic Surgeons, the American Society for Aesthetic Plastic Surgery, the Northeastern Society of Plastic Surgery, and the New York Regional Society of Plastic Surgeons. Dr. Yarinsky is available for interview upon request.